Apple launched iTunes Match three years ago to much fanfare. Other than the addition of an ad-free version of iTunes Radio, little has changed about the service, which costs $24.99 per year. What does iTunes Match do? Is it worth it? Here’s an updated look at the product. 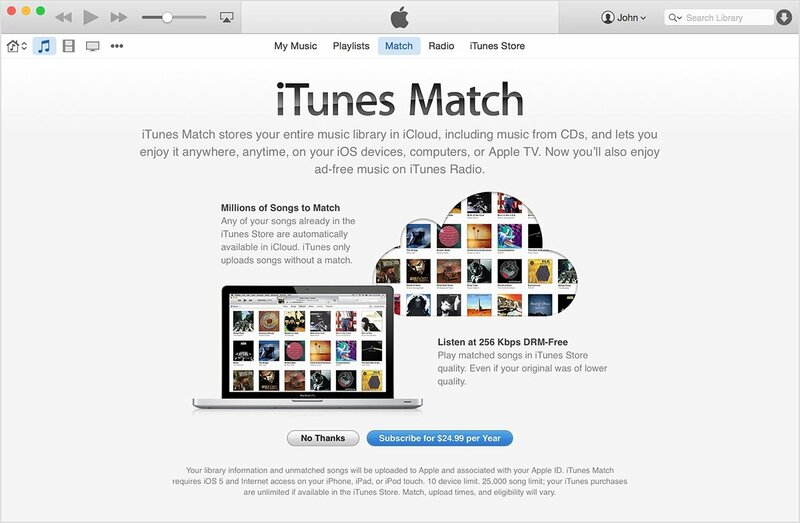 Initially only available in the United States, iTunes Match debuted on Nov. 14, 2011 with the iTunes 10.5.1 update. Called “a match made in iCloud,” the service determines which songs in your music collection (including those ripped from CD) are available in the iTunes Store. Those tracks are automatically added to iCloud, or matched, for you to listen to them anytime, across all devices. 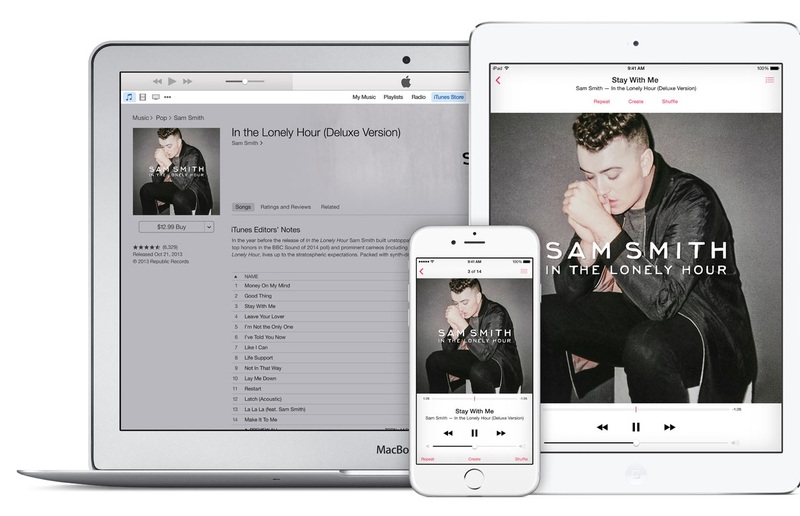 Tracks that can’t be found on iTunes are uploaded from your device to iCloud for use on any of your other devices. This doesn’t happen all that often, as there are 43 million tracks on iTunes. Currently, iTunes Match supports up to five devices using the same Apple ID — including your Mac or PC, iPhone, iPod touch, iPad, and Apple TV. 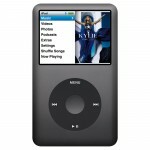 Apple will match your older files that are 96 kbps or higher, and make them available in 256 kbit/s DRM-free AAC format. When downloaded, these high-quality files are yours to keep, even if you let your iTunes Match subscription expire (more about this later). 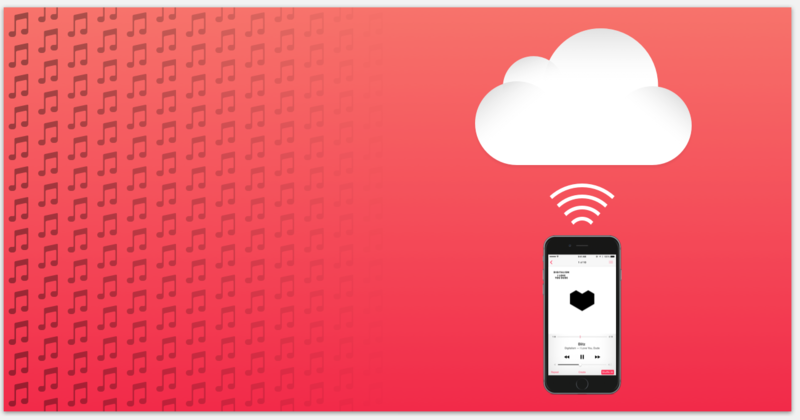 Files in the higher quality lossless audio ALAC, or original uncompressed PCM formats, WAV and AIFF, are transcoded to 256 kbit/s DRM-free AAC format before uploading to your iCloud storage account. In this case, the higher quality local files remain in their original format. Since iTunes Radio launched in Sept. 2013, iTunes Match subscribers have been able to listen to the streaming music service ad-free. However, you still can only skip up to six tracks per hour per station. After you reach your skip limit, the Skip Forward control will be dimmed for 60 minutes. Many have criticized iTunes Match because Apple limits the number of matches to 25,000 tracks, which is bad news for those with a huge music library. If your collection is higher than that number, iTunes won’t match any of your songs. Additionally, if your library grows beyond 25,000 tracks at a later date, iTunes Match will turn off automatically. Luckily, songs purchased on iTunes aren’t counted against this 25,000 track limit. Song files longer than two hours in length will not be uploaded, nor will files 200MB or higher. Also, remember: iTunes Match only supports up to five devices using the same Apple ID. This is probably fine for an individual, for a family, not so much. Finally, songs containing DRM (Digital Rights Management) will not be matched or uploaded to iCloud unless your computer is authorized for playback of that content. For a current list of countries where iTunes Match is available, click here. You can purchase a one-year subscription to iTunes Match from your computer or iOS device. Once you have confirmed your payment information and have agreed to the iTunes Match Terms and Conditions, iTunes will begin the process of matching your songs. This can take awhile the first time, depending on the size of your collection and Internet speed. When iTunes has completed scanning your library, songs that are available for download from iCloud are denoted by a cloud icon. If this icon is not listed, the song is already in your library. To subscribe to iTunes from your iOS device, tap Settings > iTunes & App Store. Be sure that you’re already logged into your Apple ID. Once you’ve signed in, tap “Subscribe to iTunes Match,” and verify your payment information. Next, accept the iTunes Match Terms and Conditions. Songs available for playback or download from iCloud will be accessible on the Music app. Again, songs that are available for download from iCloud are denoted by an icon. If this icon is not shown, the song is already in your library. By default, your iTunes Match subscription will renew each year unless you indicate otherwise. You will also receive a reminder email from Apple approximately one month before your subscription ends, regardless of whether auto-renew is on. To turn auto-renew off through iTunes, go into your account under iTunes in the Cloud and select the “Turn Off Auto-Review” button. To turn off auto-renew on an iOS device, go into the Settings app under iTunes & App Store and select your Apple ID, and then “View Apple ID.” From the Account Settings page, scroll down to the iTunes in the Cloud section. Tap the iTunes Match Renewal toggle so that it slides to the left. When you no longer subscribe to iTunes Match, you’ll lose the ability to stream or download matched or uploaded songs to your devices. Those songs already downloaded will remain in 256 kbit/s DRM-free AAC format. I’ve been using iTunes Match since the first beta was released in the summer of 2011. Overall, I like the service. However, I have noticed that some hand-holding is necessary for iTunes Match to work as promised. Logging out of iTunes deactivates iTunes Match. The service is not turned back on automatically when you log in again. To turn on iTunes Match on a Mac or PC, go Store > Turn on iTunes Match to begin the scanning process once again. This process is a lot quicker than the first time it was performed. On an iPhone or iPad, go into the Settings app under iTunes & App Store and reactivate iTunes Match. Once you have removed the playlist from iTunes, launch the Music app on your iOS device to refresh your library. Depending on the speed of your connection, this correction could take a few minutes. Occasionally, songs in your library won’t be available through iCloud. This usually occurs with songs containing DRM (Digital Rights Management). 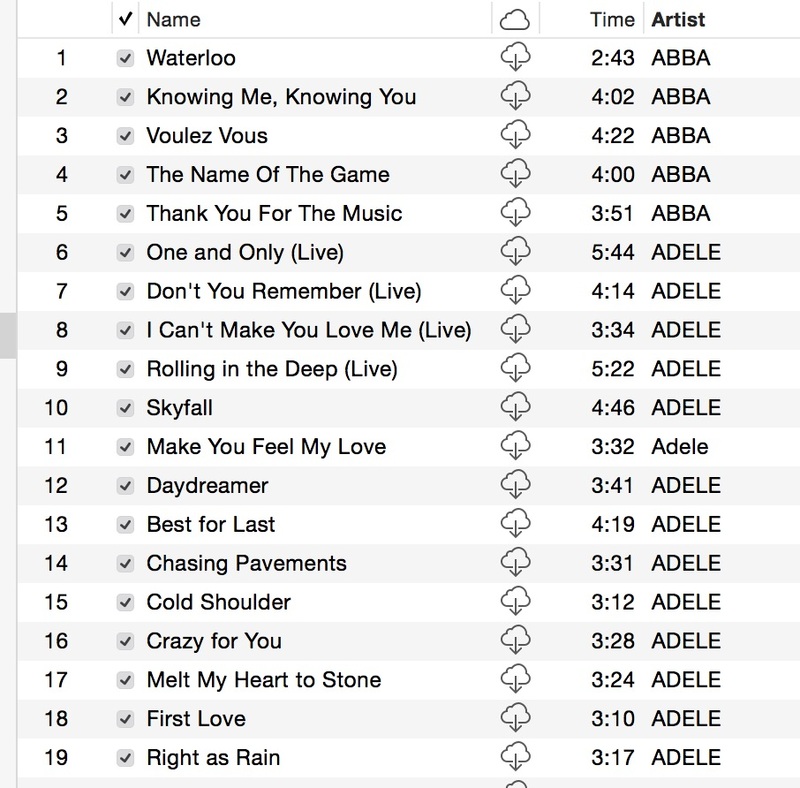 In iTunes, these tracks might appear grayed out. This can occur if your computer is not authorized to play that content. You can attempt to resolve this by authorizing your computer, and then manually updating iTunes Match. To authorize in iTunes, go Store > Authorize Computer. If you are unsure what Apple ID your computer needs to be authorized for to play a specific song, first, highlight the song in your iTunes library. Next, choose File > Get Info. In the Summary tab, locate the Account Name field in the right column, and then click Okay. You now must select Choose Store > Authorize this Computer. Type in the account name from the Summary field and enter its password. Click Authorize. Choose Store > Update iTunes Match. Still having problems? Updating iTunes Match usually is a good place to start. As mentioned above, select Store > Update iTunes Match to complete this process. Also, make sure you are always using the latest version of iOS and OS X. Each November, Apple charges my credit card $24.99 for another year of iTunes Match. Each year, I wonder whether it is worth it. When your main goal in subscribing to iTunes Match is to convert all of your music into 256 kbit/s DRM free AAC file format, and then download these tracks to your computer or iOS device, renewing the service each year might be prohibitively expensive. 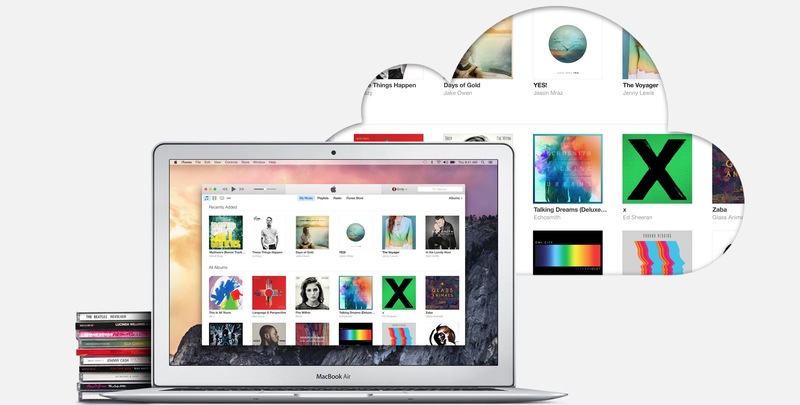 If you love the ability to download and stream music from iCloud across your device, by all means renew the service. Apple’s iTunes Match provides a nice service for those hoping to improve the sound of each track in their music collection. It also makes it easier for users to access those tracks across multiple devices. However, iTunes Match isn’t for everyone. Those with large music collections won’t benefit from the service, nor will folks without iOS devices. For everyone else, the choice is yours to make.